My response to Chapter 2: The innovator’s mindset: Empowering learning, unleash talent, and lead a culture of creativity (Couros, 2015). In Chapter 2, of The Innovators Mindset, Couros takes this idea one step further by describing the innovator’s mindset as the “belief that the abilities, intelligence, and talents are developed so that they can lead to the creation of new and better ideas” (Couros, 2015 Chapter 2, para 5). My reaction to this thinking is to interpret it as a call to action for educators to create something new with the knowledge that they have – to move beyond (as described by Couros) – an education that is provided for us towards something we create ourselves. Educators worldwide are taking hold of this style of learning as they participate in their own, self-created PD (blogs, social meets, wikis, twitter). Why can’t we show our students how to learn like this… which of course we can? This outlook also takes me back to the writing of Gee (2005) where he argues that the theories of learning prominent in many of our schools bow to a content fetish and we need to look for new ways of doing. I have quoted elsewhere in my blog Gee’s words: know is a verb before it is a noun, knowledge. This is a stark and intelligent reminder that as we professionally learn by doing, we need to also design schools that acknowledge this learning by doing. We already know this. One (there are many) important take home message fom Chapter 2 of The Innovators Mindset – within the contexts of my own professional explorations and experience – is to answer this call by designing and prototyping a very student-centred, constructivist pedagogy that recognises information is abundant and empowers students to create; with knowledge that is now at their fingertips. I see very clearly a way forward that sees educators developing and honing a pedagogy that is guided by frameworks such as those offered by design thinking, peeragogy, connectivism and an innovator’s mindset to drive innovation. This is a mindset that for educators demands that pedagogy comes first. After the development of this pedagogical framework comes integration of other technologies to support that pedagogy; otherwise it is my view that the technology, perhaps as a disciplinary technology, then controls the pedagogy and unintentionally leads to a strengthening of a content fetish. With this in mind let me try to answer the Questions for Discussion given in Chapter 2: The Innovator’s Mindset. What are some examples of innovation that you have seen within constraints, both inside and outside of schools? The Astrophotography Awards as per my previous post. The museum organisation that I worked for offered many constraints (time, space, goals, cultural) but this learning activity saw its genesis after a serendipitous meeting at a teachmeet organised via social networks. This is a great example of informal networks promoting the flow of information and innovation (Kudashin, 2012). Inside schools I see lots of innovation e.g. teachers experimenting with different ways of doing, such as flipped classrooms. I do not think flipped lessons are where schools should be headed but the method is an example of teachers learning by doing. It is an example of new ideas flowing into formal systems via informal networks that some teachers are becoming adept at building. What questions do you think are vital to understanding those who we serve in education? What questions do you think are vital to ask students so as to build empathy? 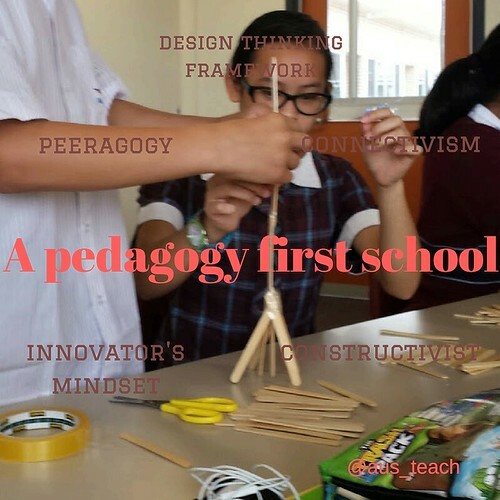 As shown in the image at the start of this blog post, the school that I would build from scratch would be what I call a “Pedagogy First” school. What does it look like? By way of an analogy, begin by picturing a traditional street intersection in a major western city such as Melbourne that is tightly controlled by visible technologies of control such as traffic lights, lane markings and road signs. Then view the embedded YouTube clip below. This video depicts, in an abstract way, my school. Have you ever walked across a road in Hanoi or Ho Chi Minh city? For a westerner who is used to tight constraints and a need for order, this is a very scary experience but once you find trust in the system and embed yourself into it…flow happens. 🙂 This system, which is culturally alien to some of us, presents undeniable risks but it flows beautifully. The “Pedagogy First” school that I envisage has less obvious constraints (technologies of control) but flow happens more readily than in a traditional school; flow of learning, ideas and innovation. This school assumes that all students want to learn. As hinted above my school is founded on a design thinking framework, peeragogy and connectivism. How do we take what we currently have to create a better education system for our entire community? Very briefly, keep building networks that allow for flow of information, ideas and innovation. Thank you for reading, please gift me with your comments. Gee, J. P. (2005). What would a state of the art instructional video game look like? Innovate: Journal of Online Education, 1(6), 159. Mr reflections and meanderings in response to Chapter 1: What Innovation Is and Isn’t (Couros, 2015). Almost every sentence of Couros’ opening chapter is written to provoke deep thinking about learning. The focus of this opening chapter of The innovator’s mindset: Empowering learning, unleash talent, and lead a culture of creativity is to revisit and define innovation. This is a pertinent approach as the modern educator is regularly called upon to be innovative and build creative cultures whilst our places of work regularly badge themselves as being contemporary and innovative. Just over twelve months ago I replied to an advertised teaching position that called for an innovative teacher. Very recently, after having worked in this college for twelve months, I was asked by leadership personnel to give a brief assessment of the school. I challenged them by stating that they did not have a clear view of what was meant by innovation. This is not too harsh a critique but a common reality as innovation is a complex concept and the boundaries between concepts such as creativity and innovation are not that clear (Anderson, 2012). The challenge for all learning institutes and educators is that they need to solidify their understanding of terms such as innovation, creativity, 21st century and student-centred pedagogy. What do these terms mean? What do these concepts look like in actual day to day learning? If we ventured into a physical or digital space of learning what would we experience that fosters creativity and innovation? …a way of thinking that creates something new and better.” (p. 378). The stance taken is that innovation is not a thing, task, or even technology but a way of thinking. This view point is important to grasp but not absolute as other thought leaders do offer slightly alternative views of innovation. For instance, Donald Kuratko (2012) describes creativity as the set of thinking skills that help bring novel, acceptable ideas into the world. Design is the process that shapes an idea into an artefact – when we design something we bring something into the world for others to comprehend. Innovation is described by Kuratko as the extended process that provides the artefact to a wider audience. In summary, Kuratko’s publication on innovation and creativity notes that creativity generally focusses on idea generation whereas innovation also includes idea implementation; importantly creativity and innovation are integral parts of the same process. This stance is also expressed nicely by Anderson, Potočnik, & Zhou (2014) who write “Creativity and innovation at work are the process, outcomes, and products of attempts to develop and introduce new and improved ways of doing things.” (Anderson, 2014). These varying ideas hint at a duality in how innovation is viewed i.e as a way of thinking or as a process (design thinking also suffers from this same duality) but they do coalesce with the stance adopted by Couros that to meet the idea of innovation something new or better must be produced. In summary, we need to acknowledge that innovation is related to the ideas of creativity, design and entrepreneurship and these related terms influence each other. Upon reflecting on this opening chapter, my take home message is that within the context of education it is very helpful to view innovation and creativity as a way of thinking. Such a viewpoint at least serves to remind us very clearly that innovation, as stated by Couros in his opening chapter, is not synonymous with technology (Yeah!) and indeed a technocentric view of innovation is not sustainable (Brown, 2009). This is extremely important point: when building new innovative cultures of learning, educators need to design strategies that focus on innovative thinking followed by designed technology integration…not the other way around. Professionally, I find these views of innovation, creativity and an innovator’s mindset liberating. If we intend to create innovative places of learning (physical and digital) then I suggest we can gauge our success by the ideas that are generated rather than the technological tools that we put in place. Innovation is about creating cultures of thinking and this is where we should focus our energies. Furthermore, in line with the idea that innovation is about thinking, I suggest that the deep shifts needed in education are in the ways educators view knowledge and learning as well as their professional place in the process of teaching and learning; indeed how they place themselves in physical and digital learning spaces. To be innovative educators, we must challenge our professional beliefs and assumptions regarding education to shift in response to rapidly changing contexts. A point of interest: Couros uses the example of Starbucks as an innovative company that met with success by continually reinventing their business. Of interest, when Starbucks came to Australia and even my home of Melbourne (Victoria, Australia) the company met with dismal failure as its business model, suitable for an America context, was not modified for the Australian context. To me, this is a stark reminder to never assume that what works well in one context is going to work in another. In education innovation needs to remain very focussed and adaptive to local contexts…even classroom to classroom. Questions for Discussion, as posed by Couros; which have got me thinking about my past and present teaching practice. I want to document a few ideas here that in my mind demonstrate a few important points regarding innovation. This digital report was made back in in 2009. The Victorian VCE Curriculum asked that Biology students submit a report of field work they had undertaken. In brief, I redesigned a traditional written task to allow students to build a narrated report. This was better on a multitude of levels but in summary, I had encouraged my students to research and curate information so as to create a new digital artefact that communicated visually and verbally their understanding of a number of complex biological concepts. I discovered that by building in the narrative component that the task demanded students take ownership of a number of key biological terms that they might otherwise gloss over in their learning. Very importantly creativity and innovation were also built into the task. The success of this one innovative idea was a turning point in my teaching career. Astrophotography Competition (2013). This event was organised after meeting the Telescopes In School organiser at a Teachmeet. She was interested in telescope work and I was interested in night time photography via the use of SLR cameras. Through simple networking and the sharing of ideas we developed an idea to engage students across Victoria in night time photography. This idea was built over networks and eventually became a statewide endeavour that, although I am now back into classroom teaching, still continues. This project taught me that sometimes you need to work around the constraints of educational systems to let innovation bubble to the surface. STEM Coding Classes (2016): This year I have initiated and run a STEM class for Year 9 boys. My STEM students teach themselves HTML by engaging with specific lessons on www.codecademy.com. I typically show the students how to administer code on their laptops by using Notepad++ or else Dreamweaver. Then I basically get out of my students way and let them engage with very student centred learning. Some students require my assistance with modified expectations but I build a culture where the students support each other in their learning coding. Peer to peer collaboration is strong and they also learn to search online for code. The buzz in the classrooms is vibrant and the students largely produce amazing web sites by manipulating code they have found and understand. (I will come back and post up examples of work..eventually). This unit of work ends with peer to peer presentations. We then incorporate robotics in the STEM experience bouncing off the same student centred collaboration. This is innovative in my setting as the classrooms are extremely students centred which leads to deeper learning and student agency. The pedagogical stance that I adopted, was to make deliberate use of knowledge networks, and make this approach explicit to my students. My position in that class is markedly different to that of other classes that I teach in…for various reasons 😉 – as I played with ideas of connectivism and constructivist learning theories. As we are viewing innovation as a way of thinking that creates something new and better in my leadership, teaching and learning I think a solid strategy is to keep building networks within my school (build relationships) and also via social media platforms that allow for a flow of innovation – such as that experienced with the astrophotography competition described above. Such an open stance increases the chances of thinking in creative and innovative ways – for teachers and students alike. One of my teaching goals is to explicitly plug my students into solid knowledge networks. Keep questioning the status quo and as suggested by Couros what is best for our (this) learner. Technology and digital social networks! As stated in this opening chapter “Today’s technology makes it easy to quickly spread innovative ideas around the world.” (Couros, 2015 p. 445) This includes into and out of our classrooms. Thanks for reading, please gift me with your response. Anderson, N., Potočnik, K., & Zhou, J. (2014). Innovation and Creativity in Organizations A State-of-the-Science Review, Prospective Commentary, and Guiding Framework. Journal of Management, 40(5), 1297-1333. Kuratko, D., Goldsworthy, M., & Hornsby, G. (2012). The design-thinking process in innovation acceleration: Transforming organizational thinking. (pp.103-123). Boston: Pearson. Food for thought: Creativity and Innovation (Could act as a pedagogical framework). For some not so light holiday reading, I have downloaded a couple of books that focus on leading innovation in education. One is The innovator’s mindset. Empower learning, unleash talent, and lead a culture of creativity (Couros, 2015). This book has struck a cord with me and as I plow through the content my own little ideas, anecdotes and trials spring to mind…which are probably worth sharing and reflecting on. However, my thought today is that I am reading the book far too quickly. So (deep, deep breath here) to force myself to slow down and engage more authentically with the contents of the book, I thought I should document my thoughts and reactions to each chapter as well as the end of chapter questions posed by Couros. As I do, I hope that I can bring others into the discussion, chapter by chapter. Anyhow, the exercise will provide me with some focus in blogging while in hiatus from my M.Ed journey. If I slip in the task please give me a prod.